Beautiful basin for an elegant powder room painted with the Gold Orchids design. The flowers, leaves and stems are matte and real metallic gold, highlighted with black. 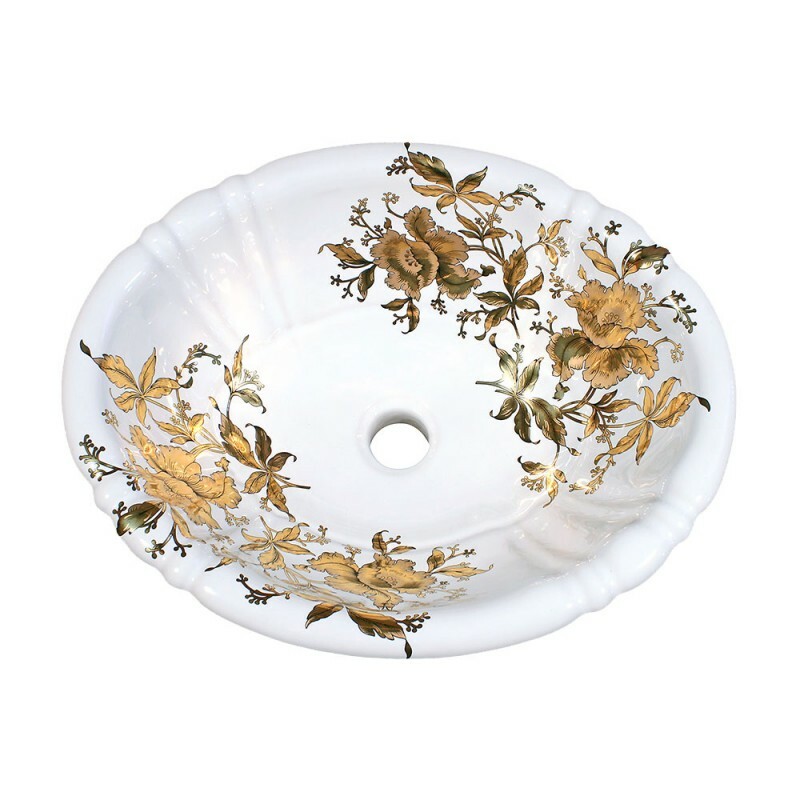 Add some bling to your bathroom, powder room or guest bath with this sink. Design is shown decorated on a white Bates & Bates Georgia Drop-in basin, 17-3/4” x 14-1/2”. Also available on the Jenny, 21" wide x 16-5/8". Both sizes of sink are available in white or biscuit. Now available in platinum with no matte platinum in the design, with black outlines & highlights. This design can be adapted of almost any fixture or accessory. 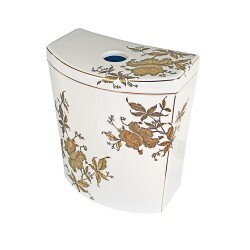 Check it out on the Kohler Devonshire Toilet Tank & Lid, and the spectcular Barclay Bali Pedestal. This luxurious sink was the foundation for my new bathroom design. I was not disappointed! My sink is elegant and complements my Fowler and Ball wallpaper. Your artistry is a joyful centerpiece for my finished design. My sink is stunning. 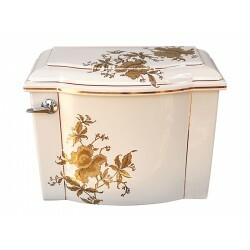 It’s in my powder room and complements my white and gold glass tiles. Thank goodness you can order a sample tile in advance to help coordinate the sink with the tiles and fixtures in your room. 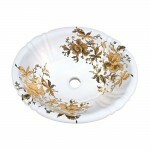 I wanted a vessel sink so Lynne applied the Gold Orchid design to a vessel sink. She is very flexible and let’s you marry the type of sink you want to your favorite design. Beyond the beautiful pieces of art she creates, my favorite thing about Lynne is she communicates. She does not leave you out in the dark. 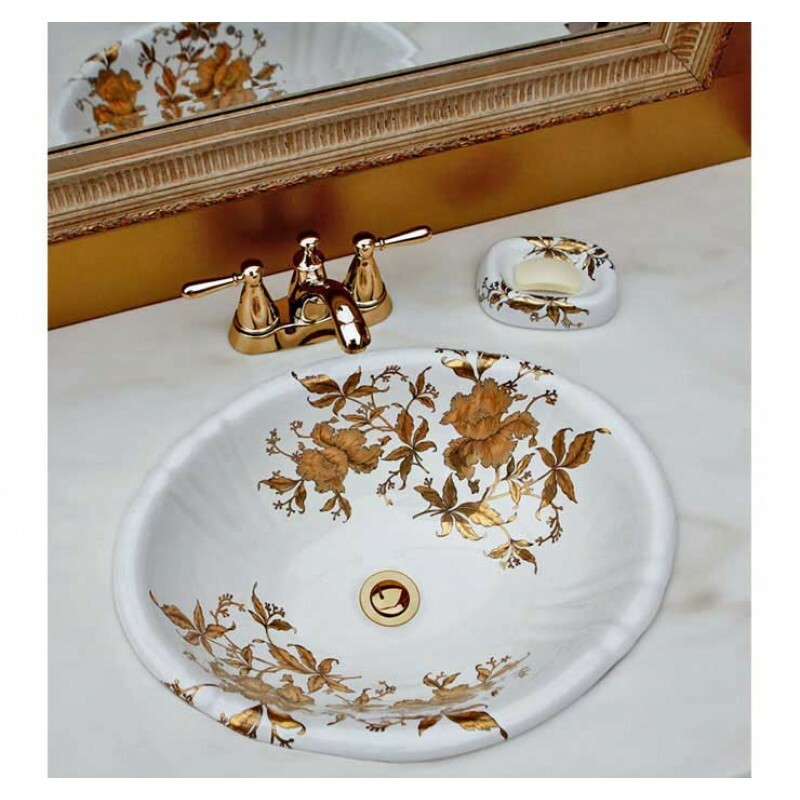 I am so happy with my sink as well as the easy process of dealing with DecoratedBathrom that I will be ordering two Chintz Garden Flute design under-mount sinks for my master bathroom in the very near future. The sink I ordered was custom in that it needed to fit an antique marble table top. With appropriate measures the vendor was able to find the perfect size. She painted beautifully the gold floral design I chose from the Internet. I was very happy upon its arrival and there were no glitches.